Onto our last game of the season and what a pretty awesome matchup! The craziness that is the Tiger train marched on while the Crows, most peoples ‘best team all year’ tries to spoil the Richmondy army. Last year I wrote a little preview that showed the path to the grand final of each time - I’ve dug up that old code and shown the same below. Happy reading! We can see below that both teams have taken different paths this year. 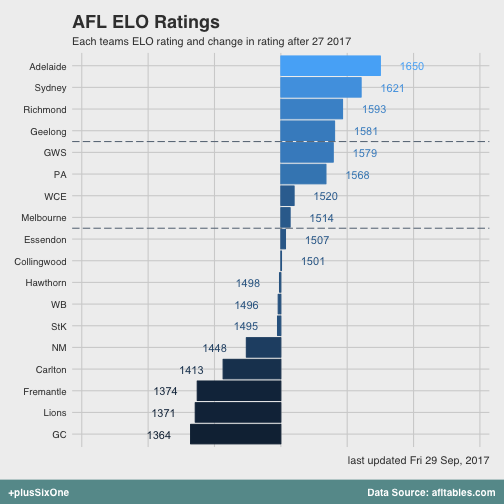 Adelaide started the year near the top of our rankings and have been pretty consistant in their rating, apart from a significant drop after round 7 and 8, where they lost to North Melbourne and Melbourne by significant margins. The Tigers on the other hand have been slowly building all season. It wasn’t until mid year they actual broke through the ‘average’ team barrier of 1500. Interestingly both teams have been on a nice upward trend since July - coinciding with really strong finals performances. We can extend these out a bit to try and look at where these teams have come from over the last few years. 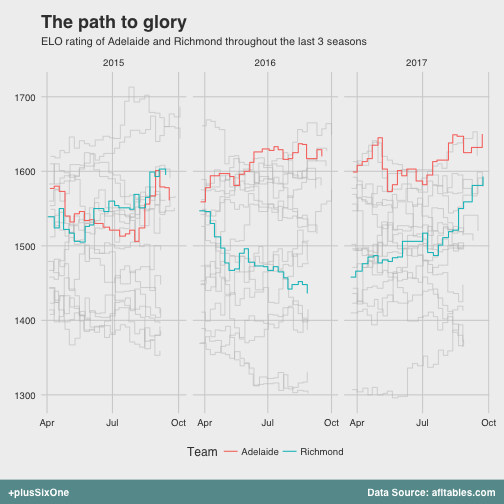 Adelaide has been on the up since late 2015. The Tigers 2016 season really was terrible! As noted in the media this week - from where they were placed at this point last year it’s a pretty meteoric rise. Where do these teams fit in the grand scheme of things? Adelaide is now our clear number one rated team. 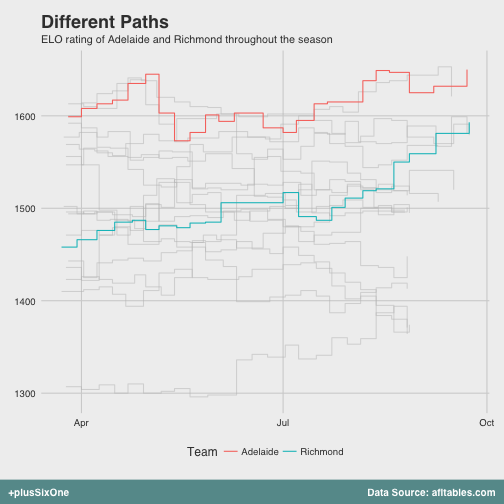 Richmond has risen the ranks rapidly over the last few weeks to sit in 3rd. Given these ratings - what are we predicting this match? 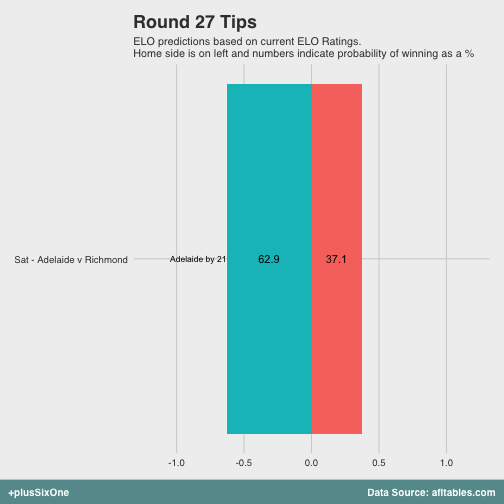 Well, with a superier rating and the nominal ‘home team advantage’, we are tipping the Crows by 21. Percentage wise, this equates to a 62.9% probability of a Crows win It has long been a bear bug of my model that I use nominal home team rather than some kind of measure of experience at the ground but nonetheless, it’s served me pretty well.